I have been inspired recently to get into the kitchen and do some cooking. It is my zen place. 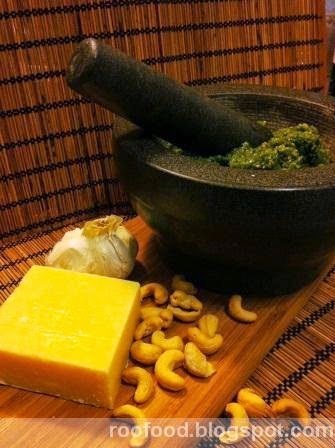 This weekend I made , amongst other dishes, salted cashew nut pesto. 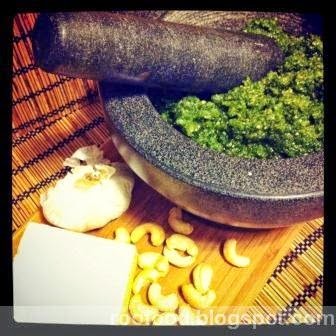 A fresh bunch of basil leaves that I had purchased at Paddy's markets during the week was sitting in the fridge wilting and knew I needed to use them up quick, so I ransacked the pantry staples and my cashew nut pesto was born - actually I have the recipe written down from a previous batch I made (when living in Dubai - yes it's been that long since I made it last). once mixed stir in Parmesan cheese. I portion out in an ice cube tray and freeze - great for portions when you need it. Great with pasta, topping on a soup or spread on toasted ciabatta and a slice of tomato!